As you may have guessed, I am rather fond of knitting and also of setting challenges for myself. So I decided to sign up for a Mystery Knit Along. For those of you who have no idea what I am talking about, a “Mystery KAL” is where a group of knitters all knit the same item at the same time (the knit along part), with the mystery being you don’t actually know what your finished object is going to look like. Some basics are revealed at the very beginning, and a new “clue” is revealed every so many days so you build up your item gradually with the benefit of having a group of people all making the same thing at exactly the same time, meaning you should have a pool of support and help on tap. The only details I have are the needle size (3.75mm – cracking out my interchangeable knitpros again), the quantity and weight of yarn required (laceweight – approx 840 yards) and that the shawl will be Faroese in shape and will have beads added. I have chosen and purchased my yarn…. 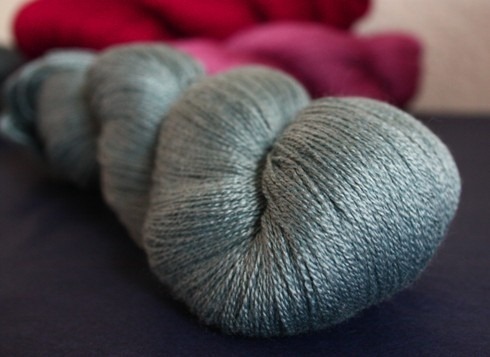 Fyberspates Scrumptious Lace Weight in the Water colourway – and it feels and looks gorgeous. The yarn is a silk and merino blend so is lovely and soft, and has much more of a blue hue than this picture shows. I have never taken part in a Knit Along. I have never taken part in a Mystery crafting thing of any description. I have never taken part in an online crafting event. I have never knit a shawl before. I have never used lace weight yarn before. I have never added beads to a knitted project before. So this KAL is going to be one hell of an experience! Clue #1 is available from December 15th. Previous Post Amineko #1 TA-DAH!! !